The Haute-Loire is named after the Loire River covering, as it does, the upper reaches of this famous river. It is one of the original 83 departments of France created in 1790 during the French Revolution and its inhabitants are called Altiligériens. 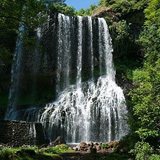 Parts of the department are included in the Livradois-Forez Regional Natural Park, a protected area of traditionally-farmed agricultural land and woodland. There are four mountain ranges running north and south. These are the Haut-Vivarais and its continuation, the Boutières range, the Massif du Mégal, the Margeride and Velay Mountains. 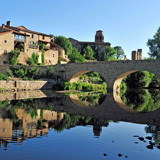 Historically, Velay has been associated with the traditional region of Vivarais, now part of Ardèche The two regions share a common dialect which is similar to that spoken in Provence, the reason probably being associated with the trade links between the two regions. 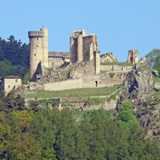 The major towns are Le Puy-en-Velay, Brioude and Yssingeaux. The department has stunning landscapes and is popular with tourists. Le Puy-en-Velay has an historic cathedral at which pilgrims gather before starting their journey to Santiago de Compostela. The cathedral has been a UNESCO World Heritage Site since 1998, as part of the "Routes of Santiago de Compostela in France". Another site of pilgrimage is at Saint Michel d'Aiguilhe, a twelfth century chapel on top of a rocky pinnacle approached by a flight of 268 steps.